A wedding in Namibia is guaranteed to be special. As an established event planner and organiser, Abenteuer Afrika Safari is well-placed to make your wedding dream come true. All we need is a flat surface. Swakopmund is a popular wedding destination and we can cater for up to 250 guests. With a beautiful white marquee, set amid the dunes or on the beach, complete with glass front, carpeted floors, lighting, candle-lit pathways, bonfires... the mood, beneath the stars and surrounded by the surreal beauty is magical. Abenteuer Afrika Safari offers a complete wedding planning service with a dedicated team of experienced wedding planners and all the equipment necessary. Top that with our years of experience, facilitating travel and logistics for large groups throughout Namibia and you can be assured of the most important factor: reliability. From priest to punch, flowers to fireworks, gazebo to gazpacho we will arrange everything for you. All you have to do is turn up (and maybe make sure the groom turns up too). And of course Namibia has a reel of ultimate honeymoon destinations; Abenteuer Afrika can arrange for group and private travel before and after the ceremony. Contact our Weddings Department to find out about the almost endless list of possibilities. 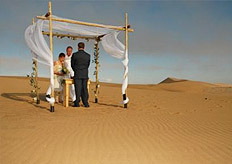 Make your wedding day extra special with a dramatic outdoor venue in the Namibian dunes. 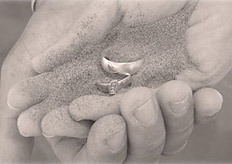 From the absolute essentials to the finest detail, our wedding planners will arrange every aspect of your wedding.